In honor of the ever famous DIY, I will start blogging my favorites DIY projects for the next week...every day! Yay! So, today we are basking in flower girl love. I have never seen this done before and am seriously lovin' it and wishin' I read this last summer when my molly was in my sister's wedding! Yes, it's that cute [drool, drool]. 3. cover an upside down bowl with a layer of aluminum foil. 4. spread out newspaper on a table & pour liquid fabric stiffener over you doily. saturate entire doily. 5. place the wet doily on top of the foil covered bowl. smooth out any wrinkles. 7. remove the dry doily from the bowl. sometimes the foil will stick to the fabric a bit. Don't worry about it. any bits of foil will pull off pretty easily. 8. you should now have a perfect bowl shaped basket! your last step is to cut a length of ribbon for a handle and tie each end to the basket. make sure that you can hold the basket by the handle and that it stays level. about 12 in. of ribbon should be sufficient, depending on how big your basket is. NOTE: be sure to test the ribbon before you start to make sure it fits through the doilies hole. 9. on the big day [yay! 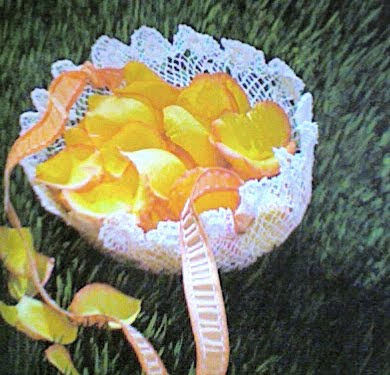 :)], fill the basket with petals-your flower girl will love and best part:it's practically free. now go::make your doily basket and be sure to stop by tomorrow to see what I have up my sleeve!